The famous German firm of Junkers-Luftverkarhr A.-G., of Dessau, will be represented in the Round-Germany Competition by no less than eight machines, six of which are ДальшеMore>>> of their own manufacture, the other two being Focke-Wulf monoplanes fitted with Junkers L.I.A engines of 78 h.p. As a description of the Focke-Wulf machines has been given elsewhere, there is no need to refer to them here except to mention that the Junkers engine is fitted. Of the six Junkers machines entered four are of well-known types, while the remaining two are of a type specially designed for the Round-Germany flight. Two machines of the K.16 type have been entered and two of the T.26 type. Both of these have previously been illustrated and described in FLIGHT. The third type of Junkers machine which will be represented in the competition has, as already mentioned, been specially designed for the purpose, and will be taking part in two examples. Not unnaturally, the Junkers firm are somewhat discreet in the matter of sending out information about this type before the start of the competition, but this much is known that the T.29 is a low-wing monoplane designed for school and sport flying. The construction is, of course, of metal, and some idea of the appearance of the T.29 may be gained from the accompanying front view, which we have been fortunate enough to obtain from the makers. The engine is a slightly higher-powered type of Junkers known as the L.I.B, which is rated at 85 h.p., so that, presumably, the T.29 will belong to the B Class in the competition. At the moment no dimensions or particulars are available. IN THE ROUND-GERMANY FLIGHT: The unusual aileron on one of the Junkers T.29's. This aileron depends upon the "tandem aerofoil" effect for its greater lift. Easy adjustments are provided for varying the size of slot. The latest Junkers monoplane. This machine has been specially designed for the Round-Germany competition. 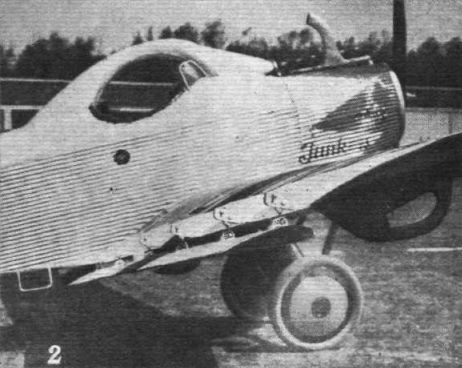 It is fitted with a Junkers engine. Getting ready for engine tests: A metal sheathed calibrated propeller is used for ascertaining the power at full throttle. 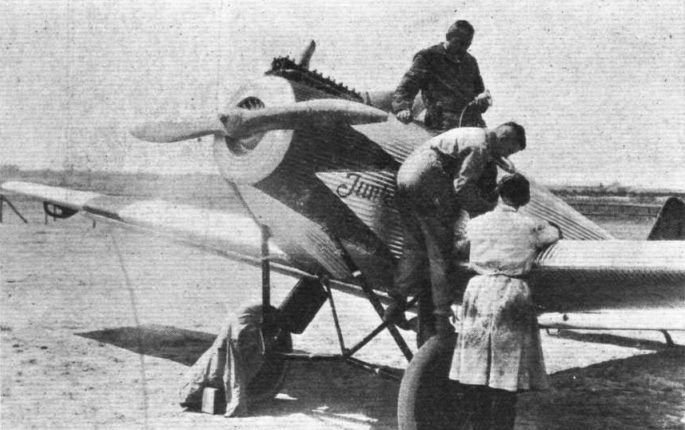 This photograph shows the Junkers T.29 being prepared.